The total number of parking spaces on campus, and the total number of parking permits, have increased since this time last year. 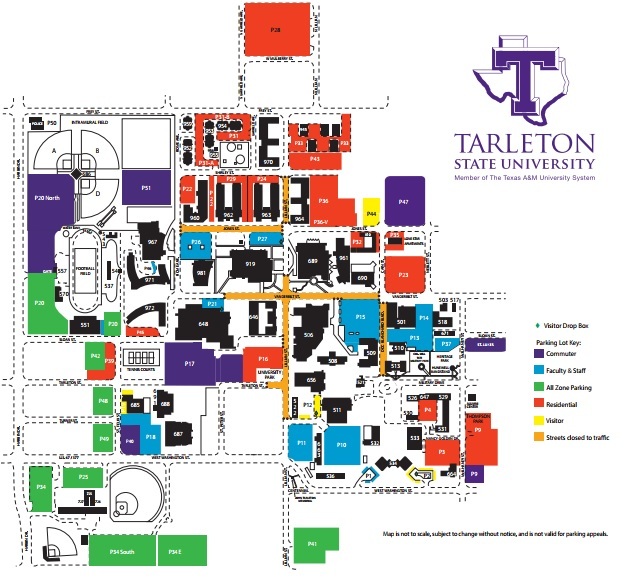 According to Tarleton police, this year there are 5,750 spaces on campus compared to 5,450 last year – an increase of 300 spaces. But the number of permits are up as well, from 3,077 last year to 4963, an increase of 1,886. “New lots have come on line and some lots came off for construction, but the net result is a gain in parking spaces,” says Shelly Conboy-Brown, Tarleton’s associate director of parking and transportation services. “This increase in permit sales was to serve students online to reduce the inconvenience of standing in a line at the beginning of the semester. In addition, increase permit sales should help reduce permit violations at the beginning of the semester. We won’t have the actual number of permits sold until closer to the 12th class day as faculty/staff and students are still purchasing their permits,” Conboy-Brown said. “We encourage students to try remote lots like the Baseball Stadium lots and the temporary lots at First Baptist Church Paradigm Ministry and Timber Ridge Church to eliminate frustration for the first few weeks of school. Hunting for a parking spot can be time consuming and we recommend parking and riding instead,” says Chief Matt Welch, Tarleton’s Chief of Police. As the new semester rolls around, you can expect another round of criticism about how bad the parking situation is here at Tarleton. With the most recent progress made in construction on campus, there’s been even more changes to where students and faculty can park and how they’re expected to navigate through campus. In light of that, the parking department has made efforts to help create effective ways in getting students where they need to be. There are lots of new things going on with the parking department, so as students do their best to manage with the downside of the construction, the parking department is hoping to see some improvements with the parking situation as the fall semester moves along. Although many students feel like parking spaces are harder to come by every semester, Tarleton media relations says the parking department is adding 650 new parking spots for commuter and residential students. These spaces will be in seven lots, the last of which will be by West End Cemetery and will be completed soon after school starts. Tarleton Media Relations states that the new lots can be found on the corner of W. Washington and St. Felix Streets, at the corner of Jones and Neblett Streets, and between the Tarleton Recreation Center and Intramural fields off Rome Street. There will be new gravel lots in the neighborhood on Tarleton and Sloan Street. The last lot near the baseball complex on South Harbin drive will add another 185 spaces as well. There will also be a shuttle service that’ll run from temporary lots in the Paradigm Ministry Lot at First Baptist Church and the gravel overflow lot at Timber Ridge church. Students will be able to park in these lots during the shuttle service hours, and this service will run until about the end of September. Conboy-Brown says this shuttle will drop off by Hunewell Hall on Military Drive. This shuttle will also take students to the Ag farm. The bike sharing program is also back this semester. Conboy-Brown said, “Through research last year, what they found is that it was a lot of residential students that were using the bikes.” In order to make it a little more convenient for them, some bikes have been moved closer on campus as opposed to one of the remote lots. As a reminder, residential students can park in the Red or Green Zones, while commuters may park in the Purple or Green Zones. Yellow Zones are for visitor parking, and faculty and staff are assigned to Blue Zone spaces. Also, for those who are not quite ready to face the parking officers in their quests to give out tickets, here are some updates that will be in effect this semester. Cars will no longer be booted. They used to boot cars for three unpaid tickets, but will now tow after five unpaid tickets. “We used to, but were getting our boots vandalized from those trying to get them off and a few actually succeeded,” said Chief of Tarleton PD, Matt Welch. Towing costs $150, which is actually the cheapest tow in Stephenville. Chief Welch said another thing is that they are now writing parking tickets on city streets near the university. The revenue will go to the city, but they don’t have the staff to monitor all the complaints caused by Tarleton students. The final change is that if a student fails to pay for tickets from Tarleton, their account will be frozen. They would still register for classes, but would not be able to get their diploma or transcript. As far as construction goes, there is a tunnel that students can walk through between the fine arts building and library to cross to the other side of campus, but expect the fences along Lillian, Vanderbilt and W. Tarleton St. to be up for a little while longer as they make way for the pedestrian mall. Next Article » Staff Editorial: Do the costs of construction outweigh the benefits?